I decided to call all the blog posts about live performances Not a Music Journalist. One because I'm not, I'm a fan. Two because a lot of my time at performances is spent singing along, dancing (lots of that) and getting with the overall energy of the artist. 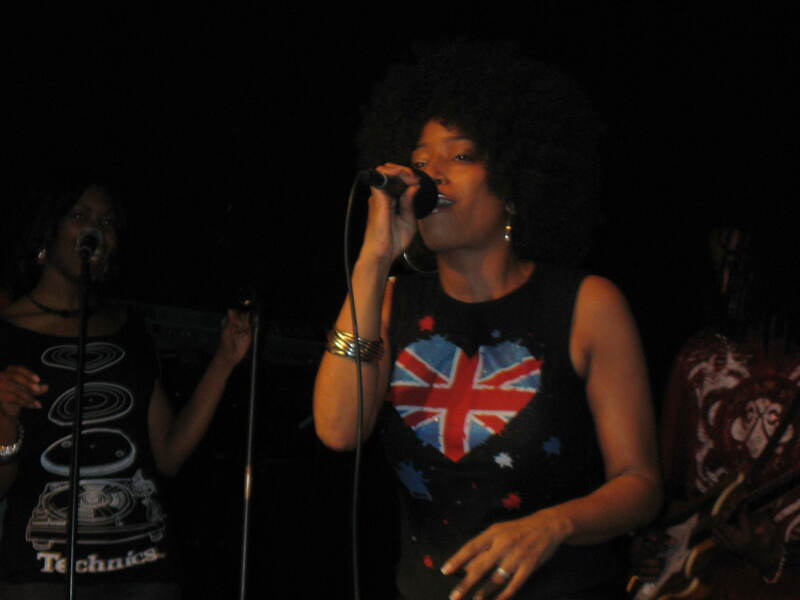 The set lists won't ever be right, nor complete because I am singing, dancing and vibing. However, I feel like the live music experience is so beautiful, I share it anyway, in a very non-journalistic, everyman fan/stan sort of way. I stumbled upon the Harmony In Life Show via a tweet on twitter from @EarwaxRecords (thank you!). 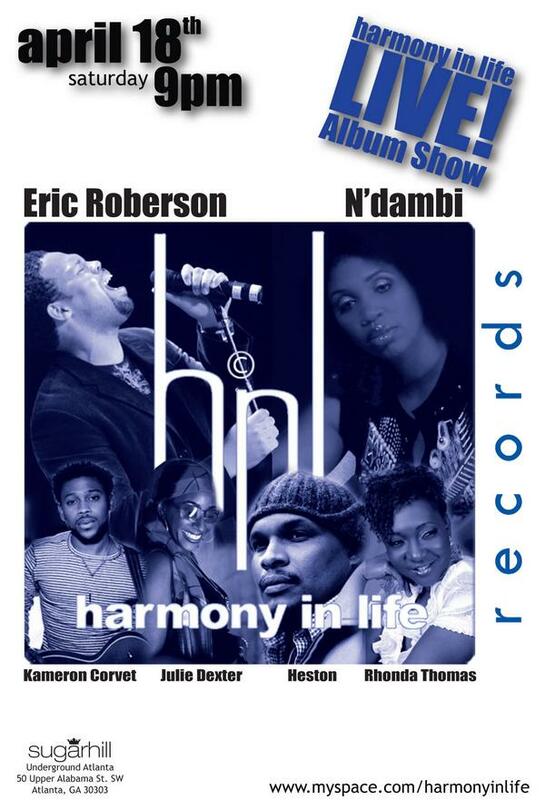 I'd never heard of Harmony in Life before, all I knew was that Eric Roberson and N'Dambi were going to be performing and I had to be there. Based on the previous soul performances sponsored by Harmony in Life rest assured they are doing a good thing promoting Soul music in Atlanta. Check out their bio on Myspace. This edition featured six artists. The first two I'd never heard of but they did some really nice albeit short sets. The opening act was Heston. Mellow music and a really sweet breezy vocal. Heston as with all the acts are backed by the Harmony in Life house band Misty Rose (young, tight and can play anything). Second up was Kameron Corvet a product of Morehouse, soulful but with more of a folkish rockish vibe. Would like to see both him and Heston in more extended sets and expect to do so in some upcoming shows. Third up was Rhonda Thomas whose name I was familiar with but really couldn't associate her in my ear with a particular sound. 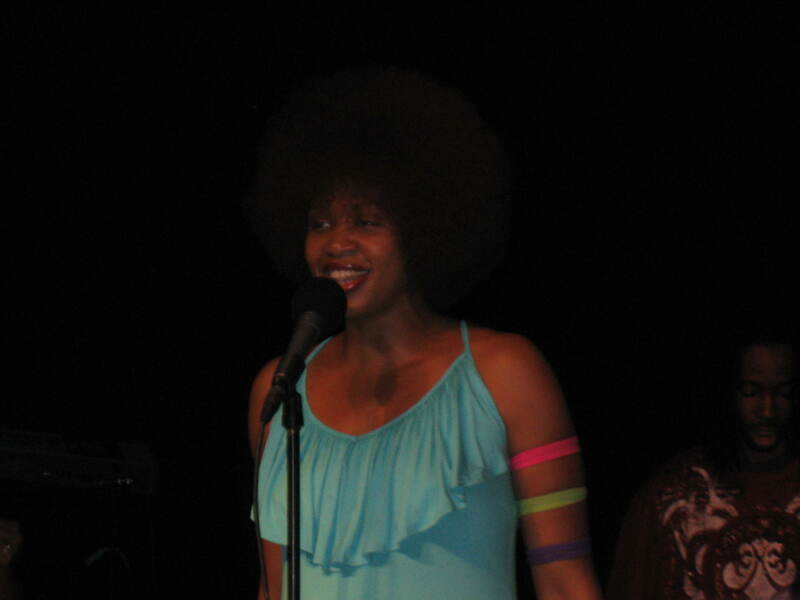 She has sung previously with the legend, Issac Hayes and with one of my favorite's India Arie. However I still don't have a good idea of her sound based on this performance. Definitely want to hear more. The next to the last performer was the Energy known as N'Dambi. My BFF whom I attended the Saadiq concert with turned me on to her when she released Little Lost Girls Blues and I've been checking her ever since. Her performance is energetic, her vocals, deep, truthful and fun, which is something you don't see a whole lot of. I don't recall seeing an artist smile the way that she does throughout the show, she's serious and she's seriously enjoying the experience. My girlfriend, who had heard none of the artists on tap that night REALLY enjoyed her. I am breathlessly awaiting her next release and performance in the A this summer. Finally the man we were all waiting for (in the pressure cooker of Sugar Hill) Eric Roberson stepped to the mic and let me tell you some folks fell in love that night, with him and with each other. He was fresh off a performance late that afternoon in Charlotte NC and you would never know it. He sang the jams Couldn't Hear Her, Softest Lips which he broke down into Prince's Adore midway (approached a faint on that one), Head to Toe (on which my girlfriend melted), Been in Love, a freestyle song he made up about air conditioning and other words shouted out from the audience and more. The thing about Erro is that he could sing Old McDonald and that voice would knock you out. I need to catch him again… and again and again when he comes to the A. Overall I love what Harmony in Life is doing for soul music here in Atlanta. You know for the last decade or so this town has been dominated by hip-hop or what is passed off has hip-hop. Don't get me wrong I love it, but soul music is closet to my soul and I appreciate what they're doing. The line-up was all soul and all unique, the house band is excellent as is the host. The venue Sugar Hill is a night club, a very HOT nightclub and some folks were having trouble with the heat. However the set up is good because you can stand on the dance floor all the way up to the stage and the club is u-shaped with an upstairs. eck out future shows, HIL is doing beautiful things. I couldn’t let this day pass without showing my love. Miss you Marvin.